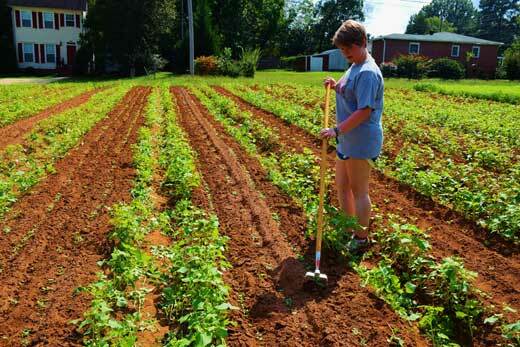 Much of the labor of growing and harvesting at the Oxford Organic Farm comes from students. More than 150 work on the farm in some capacity. A transformation has taken place at 406 Emory Street in Oxford, Ga. What once was a large open pasture now is the site of quarter-acre vegetable plots. What once was a quiet homestead where nothing visible had gone on for many years now is a working farm, bustling with the energy of dozens of students. This is the Oxford Organic Farm, and despite being in operation less than a year, it is already making a significant impact on Oxford College. On Saturday, Oct. 18, the farm's successful launch will be celebrated with a grand opening at the farm from 10 a.m. to 12 p.m. There will be tours of the farm, music by the band Mercy Street, and a ceremonial tree planting. The Emory community is invited to attend the event. The farm in its present iteration is young, but behind it are years of planning and an Emory pedigree. The property was bought in 1948 by Marshall and Fran Elizer, beloved figures at Oxford College. Marshall Elizer served in various teaching and administrative roles from 1946 to 1978, and Fran Elizer served as library assistant. When the two needed to move to assisted living about 10 years ago, the move was made possible by Trulock Dickson 72Ox 74C, who purchased the property from them but assured them they could return at any time. Marshall Elizer passed away in 2009. In 2011, following Fran Elizer's death, Dickson decided to donate the property to Oxford. There are many opportunities created by a windfall of land, but Oxford College Dean Stephen Bowen had been talking with Dickson for several years and was eager to use the property to create an organic farm. "As standards for what students accomplish in the classroom have increased over the last three decades, the average student's contact with the natural world has decreased," Bowen says. "Many students are eager to get their hands dirty, smell freshly cultivated soil, and get a better understanding of where their food comes from. Learning the potential of sustainable organic production is an invaluable enhancement of an Oxford education." Bowen adds that the scale was right, at just over 11 acres, and the location was ideal — 700 feet from Oxford's campus. A feasibility study led by Mike McQuaide, Oxford professor of sociology, confirmed that an organic farm on the Elizer property could be profitable, and Oxford began a series of steps necessary to open it. A critical goal was to find the right farmer to lead, and a national search found Daniel Parson. Parson brought 15 years of experience in organic farming to the Oxford role. He earned both a bachelor's degree in biological sciences and a master's degree in plant and environmental science from Clemson University. His accomplishments have been recognized with both the Georgia Organics Land Steward of the Year Award and inclusion on the Mother Nature Network's 40 Farmers Under 40 list. Since coming this past January, Parson has accomplished the property's transformation into a going concern. He has also overseen the building of a barn that is a hub for operations, housing field equipment as well as the washing fixtures, walk-in cooler and packing areas where the farm's produce can be prepared, packed and distributed. Much of the labor of growing and harvesting comes from Oxford students. More than 150 work on the farm in some capacity. Twelve students are work/study participants, logging approximately 10 hours per week. The remainder are there as part of the requirements for one of their courses. Five Oxford faculty members have incorporated the farm into their course curricula. These include classes in economics, philosophy, environmental science, sociology and Spanish. The farm is the actual classroom for the Sociology of Food, a class developed and taught by Deric Shannon, assistant professor of sociology. "As an experiential form of teaching and learning, the farm provides fertile soil for growing both crops and engaged learners. Students work on the farm and classes typically take place in the barn," Shannon says. "While we discuss sociological inquiry around food, students actually help produce crops, diminishing the often wide knowledge gap between what is grown on our farms and what appears, as if by magic, on our dinner tables. Indeed, the magic happens somewhere that students might find unlikely — in the dirt!" Lindita Camaj, a sophomore from Bronx, New York, is a work/study student on the farm. In high school she volunteered at the New York Botanical Garden, but otherwise had no experience in growing things. She says she has found the work to be "tiring, yet fun and rewarding." "How often do you get the opportunity in college to work outside?" Camaj asks, adding, "I've learned how to plant and how to hoe. I've learned how much energy goes into the smallest details. I will never see carrots the same way again." On a recent Thursday afternoon, Camaj was in the barn with two other work/study students, packing boxes with bok choy, arugula, kale, turnips and radishes. Outside, a steady stream of cars drove up, bearing customers picking up the week's fulfillment of their Community Supported Agriculture (or CSA) subscription. Besides sales through the CSA, the farm's produce can be purchased from Parson each Tuesday at the Emory Farmers Market. Sodexo purchases a significant amount of produce from the farm, and it winds up regularly on the plates of those eating in Oxford's dining hall. Parson also invites visitors to drop in when in Oxford. Be forewarned, though, he may have a job for you if you do.